4 Beds 2.5 Baths 1 Partial Bath 2,399 Sq. 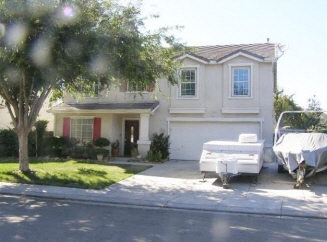 ft.
Beautiful 2 level, 2399 sqft, 4 bdrm 2.5 bath home with built-in swimming pool and RV area. Includes 20x13 family room with gas log fireplace and large 20x13 kitchen with Corian counters and island work area. All 4 bedrooms and 2 full baths are upstairs with inside laundry. Floor coverings are upgraded with the best wood laminate possible! The backyard is a must see! Lots of palm trees, 36 ft covered patio, outside kitchen with bar and pool.